Musical greeting cards contain mercury, a dangerous chemical that cannot be put in recycling or the garbage. Find out how to dispose of musical cards. Before recycling a greeting card, remove parts that have glitter, foil, metal charms, felt cutouts and ribbons. All of these items will contaminate the paper recycling. Foil lined envelopes cannot be recycled, so throw them out. Recycle the envelopes of greeting cards as paper. It’s okay to keep stamps and adhesive strips when recycling envelopes or cards. St. Jude’s Ranch for Children operates a recycling program in which the greeting cards are made new again. Find out how to participate. Avoid purchasing gift cards that are covered in glitter and other decorations because these cards are non-recyclable. Also consider not purchasing greeting cards that come with foil-lined envelopes. Sending your cards electronically is not only more economical and timely, but much more environmentally friendly. One way to reuse greeting cards is to make them into gift tags. Simply cut out any part of the card, write a little note on the back, and use that as a gift tag. Making and transporting greeting cards has its own carbon footprint on the environment. 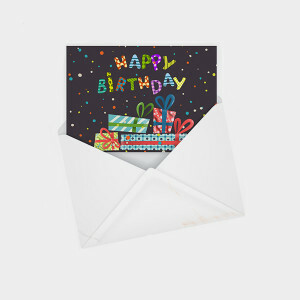 It is estimated that the average greeting card produces 600 times the carbon dioxide as an email (Verus Carbon Neutral). Americans purchase enough greeting cards to produce the same amount of CO2 as 22,000 cars annually.